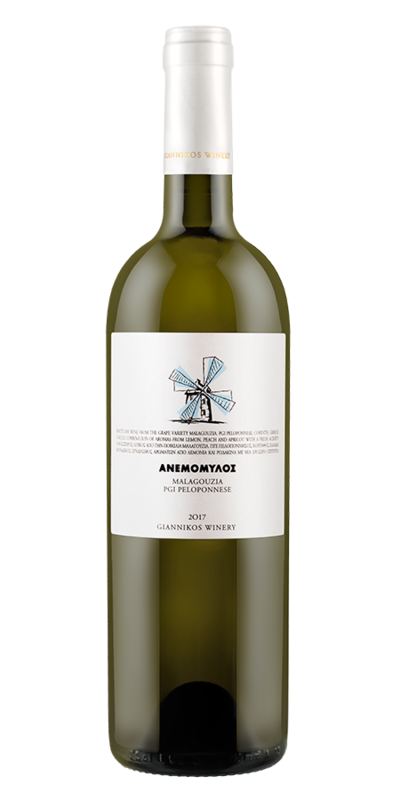 Malagouzia is an indigenous grape variety of Greece. Winemaking: Hand-picked and hand-sorted, skin contact fermentation in stainless steel tanks at a constant low temperature. Tasting notes: Light green-yellow color, intensively aromatic with clear scents of apricot, peach, pear and a natural hint of lemon peel. Well balanced with a fresh acidity. Food Pairing: Seafood, poultry, light-sauced pasta dishes and fresh vegetable salads. Label: Windmills are an iconic feature of the Greek landscapes and a favourite topic for writers and painters.